This challenge will be more like one of Ted MacRae’s Super Crop Challenges. Can you figure out what this might be? Can anyone explain the relationship between what’s shown here and its name? You should be able to get to family here. I’ll hold all comments in moderation for a while this time. And if that truly is an onychophoran, I’m jealous as heck! I was extremely pleased to find one of these. It is an Onychophoran (a velvet worms). A Costa Rican location makes it of the Family: Peripatidae. Onychophora means “claw bearers” from “onyches” for claws, and “pherein” for “to bear.” Peripatus is derived from “peripatetic”, which means “wandering”. This refers to the characteristic flowing movement of the organism when moving & is caused by the alteration of fluid pressure in the limbs as they extend and contract along the body. Sounds like someone is as fascinated by these as I am :). Peripatidae, a kind of velvet worm? OK, my record on these has not been great recently, but I’d say this has to be a Onychophoran = Greek “onycho” claw, or nail, plus “phora” bearer (Borror, Dictionary of Word Roots and Combining Forms–recommended by you on BugGuide, and one of my most-consulted references). I see the little claws here on the (?) prolegs. Looking at the informative Wikipedia article, I guess this would be a member of the Peripatidae. I still use that book almost every time I take time to research something. It is indeed a Peripatid. I suspect your guess was more informed than wild :). 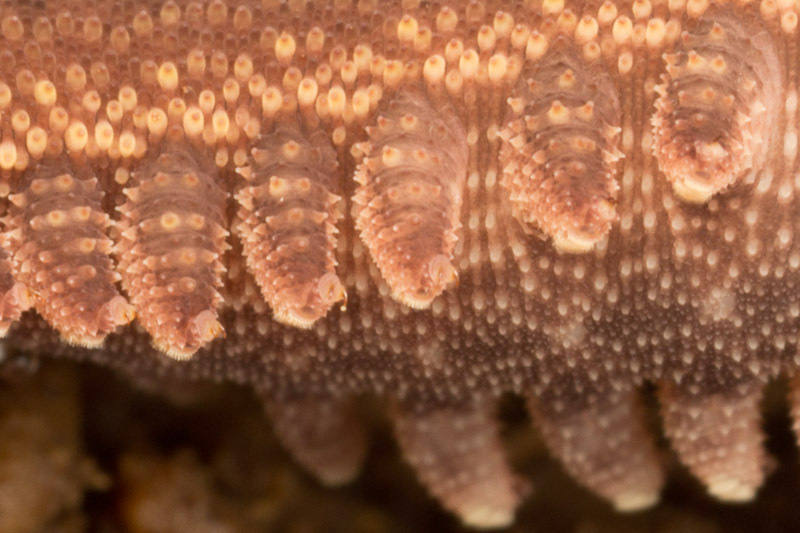 An easy one…a velvet worm. Easy for you maybe! I’m happy everyone here figured it out, but I’m sure some readers were clueless. Have you found many in your travels?